Choose from our range of multi-purpose products to help make light work of fallen leaves. With the flick of a switch, enjoy the multiple functions of blowing, mulching and vacuuming. Choose from a range of garden power tools by big name brands in a price to suit every pocket. Why not get rid of garden debris with a high-speed garden shredder? Shred branches, leaves and grass with an easy feed, large capacity shredder. Create a luscious lawn with a little help from World of Power. Clear your grass of moss, weeds and other debris with a lawn raking scarifier. For pitch perfect results, use a lawn roller on freshly laid turf and invest in any one of our lawnmowers to help make light work of maintaining your lawn. Fitted with a high quality, high power 1100w electric 230v motor the Stihl SHE71 offers high suction levels. 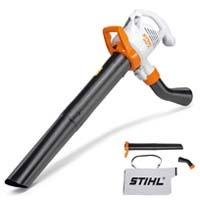 Maintaining the garden this Autumn is much easier than ever before with this high powered handheld blower vac from Stihl. Designed with a 10m power cable which is ideal for smaller gardens allowing you to blow or vac where required whilst the strain refeif means the blower is saved from damage. Offering the versatility of blowing, collecting and shredding debris all in one machine with quick change from blow to vac without the need for tools. The included vac kit and integrated turbo wheel shreds leaves to 1/12 their own volume whilst the catcher bag acts as an effective dust filter. The collection bag is emptied using the zip at the bottom of the bag and features a carry strap making a more comfortable use. Complete with vacuum kit, flat nozzle and collection bag with carry strap. Warranty period for the SHE71 is 2 years domestic and 1 years commercial. Lightweight electric garden vac with 3000w motor capable of blowing at 200kph with a suction capacity of 180 litres/sec. Designed with a mulching action, it has a shredding ration of 10:1 with a collection bag capacity of 45 litres so you can collect for longer without the need to stop and empty. Weighing in at only 6kg this blower vacuum is fitted with a 12m power cable so you can reach the ends of your garden with ease. The built on wheel at the end of the machine easily guides the blower around the garden taking strain off the arm holding the machine. Easily convert between blow and vacuum modes using the built in function lever – no tubes need to be removed or changed for the modes to be swapped. The cover of this blower/vac is easily removed to assist cleaning of the unit so that the efficiency of the suction and blow functions are maintained at maximum strength. The blower easily opens so you can easily clean this machine should it become clogged or dirty over the years. Comes complete with 12 months guarantee. 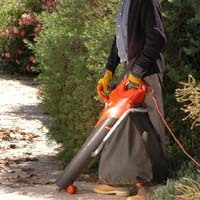 The Cobra BV2600 electric leaf blower vacuum is fitted with a 2600w electric motor powered by a 230v domestic supply. Comes complete with vacuum kit which includes a 45 litre collection bag. With a high 270km/h air speed. Converting from collect to blow in an instant with the ‘quick exchange’ lever which means clearing your garden is simple and effortless. Featuring a mulching blade which mulches to a 10:1 ratio meaning you can keep going for longer between emptying the carry bag. The Cobra BV2600 blower is lightweight at only 4kg with improved support and balance whilst the front wheel increased the blowers manoeuvrability and provides operator support during long periods of use. Comes with 12 months warranty.